Our online platform gives traders 24×7 access in order to monitor open positions, to close positions, or modify their deal. 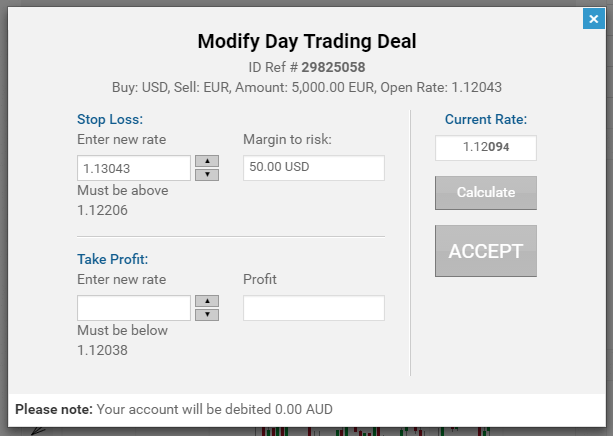 Modify: The trader is allowed to change his Stop-Loss or Take Profit at any time while the deal is still active. As previously mentioned, doing so would affect the amount of margin needed for the deal. 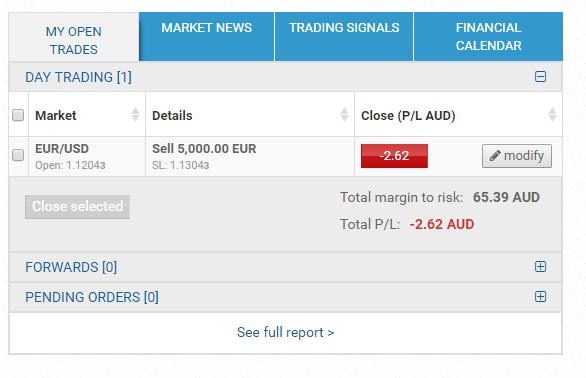 If the trader changes the Stop-Loss downward, (in a case where the position is losing and is now near the automatic closing), then additional funds will be required for margin. If the trader changes the Stop-Loss upward, (in a case where the deal will already see a profit and the trader wishes to define a higher Stop-Loss to decrease the original risk) then the difference will be credited. Note that unlike a Stop-Loss rate, the trader does not have to define any Take-Profit rate. However it would be advisable to do so, so as to allow the trader to focus on tasks other than rate-watching.